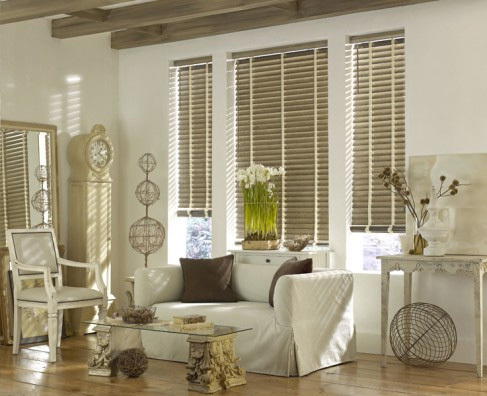 Woven wood shades, a contemporary version of the 1960s-style bamboo blinds, are one of the most popular window coverings today, the foremost being the "green " factor. Expertly handcrafted from all natural woods, reed and grasses that provide rich coloring and textural details. Available in flatfold, hobbled, waterfall, top down bottom up and dual shade. Choice of privacy and or blockout liners. Optional clutch lift system with continuous cord. Accent trim available in 35 color options in 1/2" and 2.5". The perfect choice for those special rooms where the warmth and beauty of finely-crafted wood is desired and features rich furniture quality stains. Available in a sumptuous variety of painted and stained finishes surely to enhance the look of any room in your home. For the value-minded , also available in a selection of Faux Wood Blinds, with the look and feel of genuine wood – but at more economical prices. Features include 2" slats, complimentary 3 1/4" crown valance, braided ladder construction. Options include routless slat design ( no visible cord holes ), designer decorative tape, battery-operated tilt motorization and remote control, slat cut-outs to clear window obstructions. 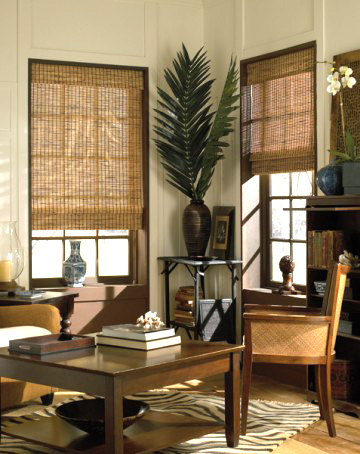 Fabric shades offer the most value when it comes to window decorating. 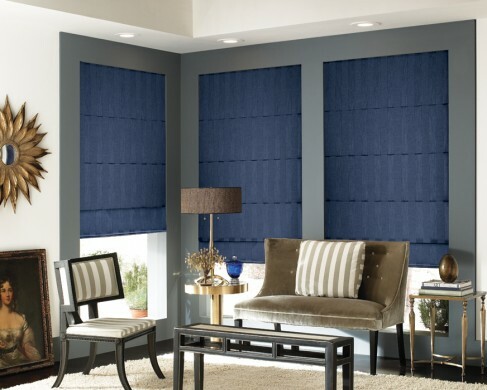 Not only can shades be aesthetically pleasing, allowing a radiant print or textured fabric to shine as a major focal point in a room, but they also serve the dual purpose of providing privacy when needed and shelter from the heat or cold. Stylish shades can be easily suited for all any room setting, appearing formal or casual depending on fabric choice and style. Styles include Flat Fold, European, Plain and Soft Fold. A variety of fabrics available offering differing degrees of privacy and light control. Features include tailored upholstered headrail, top-down/bottom-up, cordless, continuous cord loop, 2-on-1 headrail. Standard lining included with the option to upgrade to Thermal Sateen, Standard Blackout and Premium Blackout.